Following on from the success of the fabulous Force2 60, Joysway have created a compact version called the ‘Binary’. If proof were needed that good things come in small packages, this is it! Although not able to cope with the wind levels of the Force2 60, the Binary will turn in an amazing level of speed from the very lowest breeze. The sleek twin hulls cut though the water with ease and stability and turning are enhanced by the fin on each hull plus the deep twin rudders. 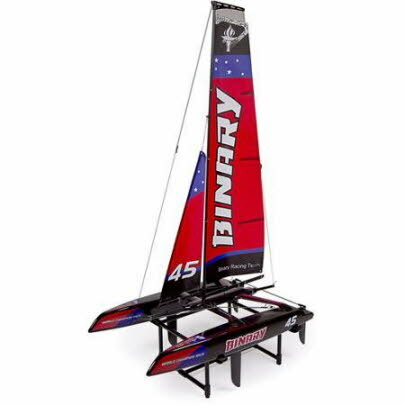 The hulls and connecting frame are all moulded from durable plastic and the masts are made from extruded GRP giving the rigidity needed in a catamaran. The radio is Joysway’s regular 2 channel 2.4Ghz design, proven over the years to be easy to use and reliable. The Binary comes as standard with a stand to rest her on which can be easily disassembled if required. The Binary brings the fun of sailing a catamaran into a very affordable sector of the market.